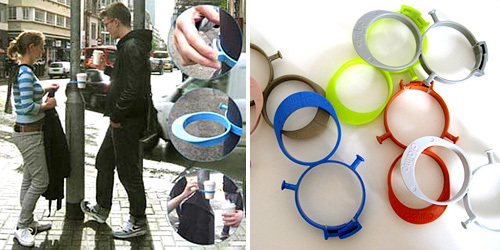 Urban Cup Holder For The Remarkably Lazy | OhGizmo! I like living in the city but have to admit I really hate it when people stop and stand in the middle of the sidewalk oblivious to the pedestrian traffic trying to get around them. So I can’t say I’m that big a fan of this urban cup holder which is basically designed to clamp onto a post or pole and hold your hot beverage while you stand around shooting the breeze. The aim of the urban cup holder is to encourage people to reinterpret street settings and claim them as their territory, instead of just using them as a means of passage from A to B. The cup holder is easily clamped with one hand to posts in the street, then used as a coat/bag/umbrella hanger and a drink holder. In turn, giving the user a feeling of control and creating a more personal space, a temporary territory. You get one from UpToYouToronto.com for about $15. Kind of a cool idea I guess but they really are grasping at straws. Wonderful, something else to encourage people to hang out on street corners. Maybe they could make little plastic pistol holsters. Well, at least the garbage will be closer to eye level now.